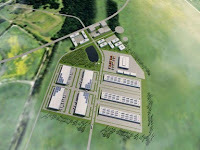 Is the Planned 1,300 Acre Logistics Park in Santee, SC in Trouble? The developer of the 1,300-acre Global Logistics Triangle project near Santee said Monday that it was not authorized to speak to the financial troubles of its heavily indebted parent company, Dubai World. Dubai World rocked global financial markets last week when it said it was seeking to postpone payments on some $60 billion in debt.